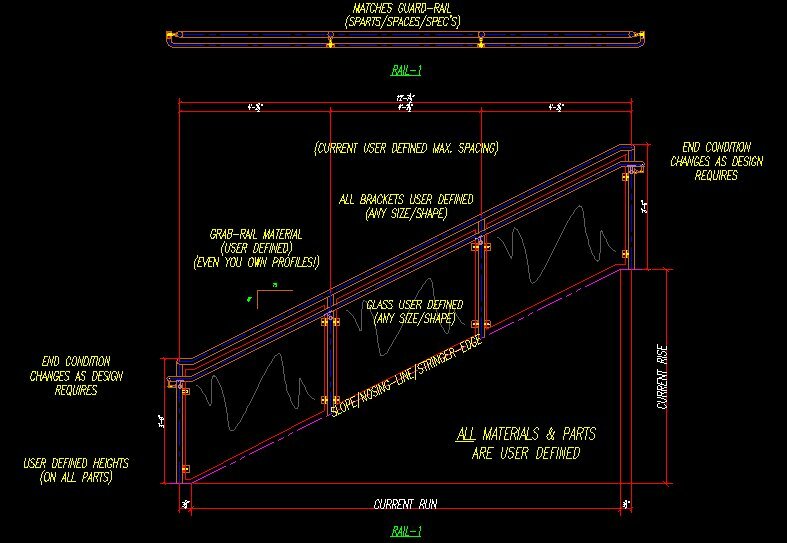 The ULTIMATE in Railing Design & Drawing software! 1) Changed dimensioning functions in New Millennium Railings, with the ability to use a limited dimension-set on erection drawings, and a full dimension-set on Shop Drawings. As a bonus the pickets are now dim'd from each post and for spacing & quantity. Also each infield bay is dim'd for picket center-to-center. Added additional Arc'd functions to New Millennium Railings, with the ability to draw/map the chord/rise bending points of the Top-Rail & Grab-Rail center-points at each post (also provides the inside railing points too!). As a bonus, the chord/rise points can be divided into 12"(+-) increments. 1) Added b.o.m. 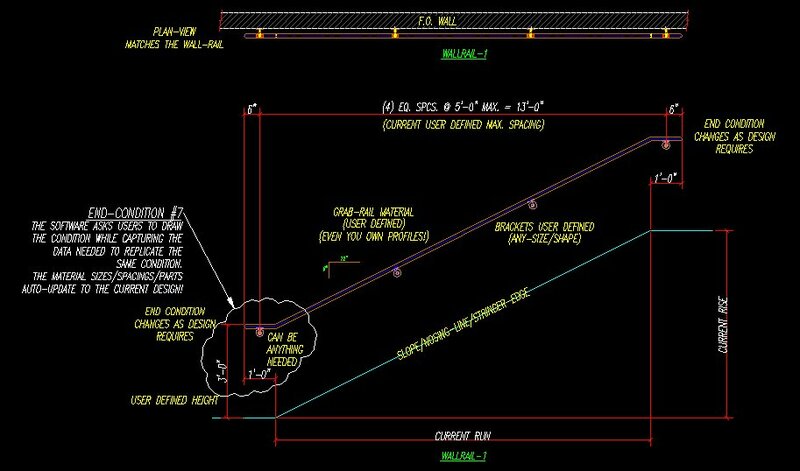 to New Millennium Railings Shop Drawings. Piece parts with material descriptions, lengths and weights. 2) Adjusted Title-borders for a better scale-factor around the railings. 3) Fixed railing blocks (blocks each railing individually so the can be moved around and used in erection drawings easily. Also when a railing is modified, everywhere the railing occurs it's auto-updated). 4) Data adjusted for Auto-Shop-Drawings. 1) 3D-Railings updated to work with New Millennium Railings data (Flat working, Sloped & Stair Soon). 2) Updated to be Auto-drawn directly from New Millennium Railings plan-views. 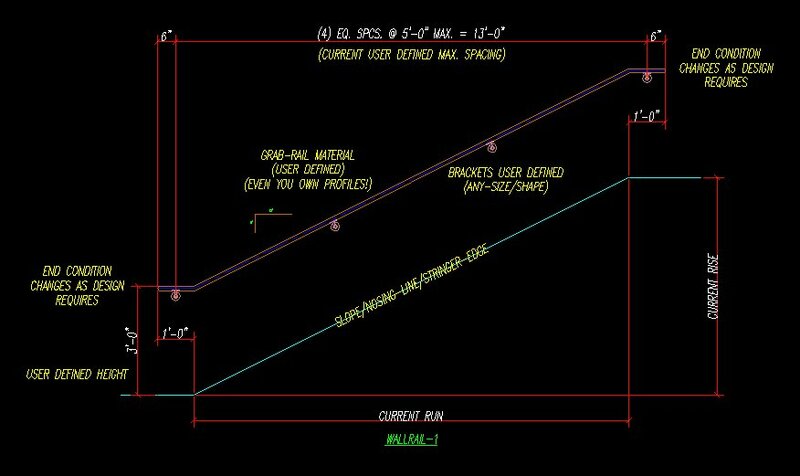 (3-9-13) Grab-rails & Wall-rails now have a 7th end option! 7=Customized! (users can add ANY end-condition they need, by drawing the end-condition! The software allows users to draw/save/edit/delete these end-conditions too!). Example... At the bottom of a stair, the grab-rail/wall-rail extends 4" past the 23" normal end of the rail, then turns 45 degrees and extends another 12" then turns into the wall (leaving a 1/2" space between the end of the rail and wall). The wall bracket is places 6" from the end. 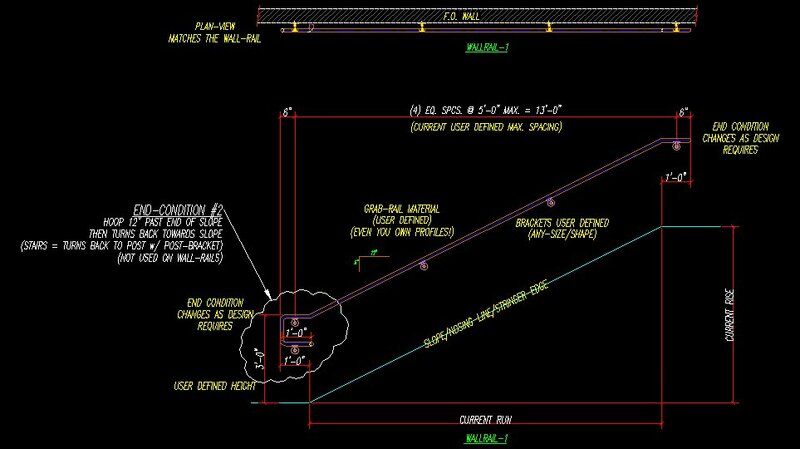 (Please Note: Grab-rail diameter, bracket & spacings auto-change to current design specs! 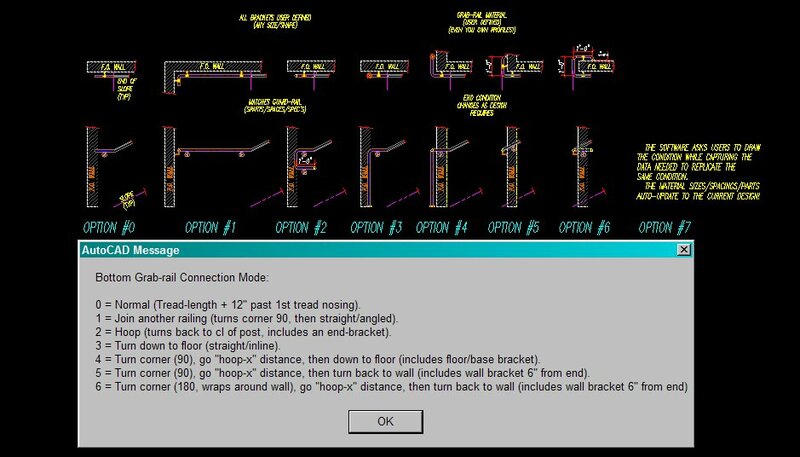 (2-30-13) Grab-rails & Wall-rails now have 6 different end options! 0=Normal (Tread-length + 12\" past 1st tread nosing). 1=Join another railing (turns corner 90, then straight/angled). 2=Hoop (turns back to cl of post, includes an end-bracket). 3=Turn down to floor (straight/inline). 4=Turn corner (90), go \"hoop-x\" distance, then down to floor (includes floor/base bracket). 5=Turn corner (90), go \"hoop-x\" distance, then turn back to wall (includes wall bracket 6\" from end). 6=Turn corner (180, wraps around wall), go \"hoop-x\" distance, then turn back to wall (includes wall bracket 6\" from end). 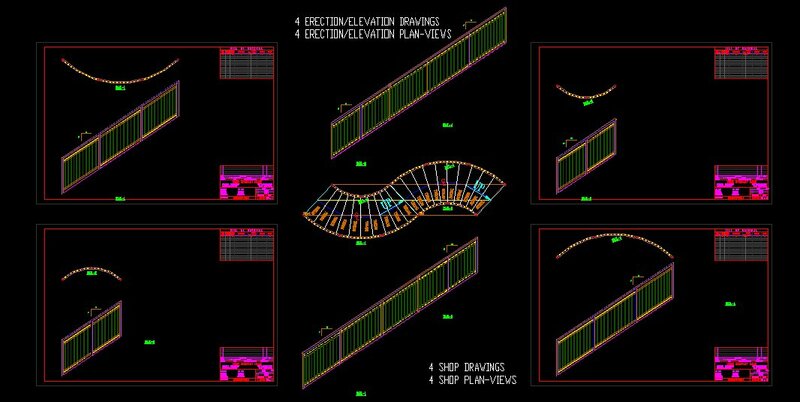 As you enter the direction & distances, a 3D railing is drawn (multiple turns in any direction) and the data is saved for both the elevation and plan views! Users can also save/edit/delete these end-condition data-sets! And in any direction (including left, right, up and down)! (1-14-13) Customized Cable railings of any style added! (1-13-13) Customized Mesh railings of any style added! (12-25-12) Sloped Arc'd Stair railings added! Arc'd stairways can be drawn in under 1 minute! Added 12-26-12 This is the Video and Drawing sample! (12-13-12) A Sample Drawing of 35 Erection & Plan-views in under 10 minutes!! 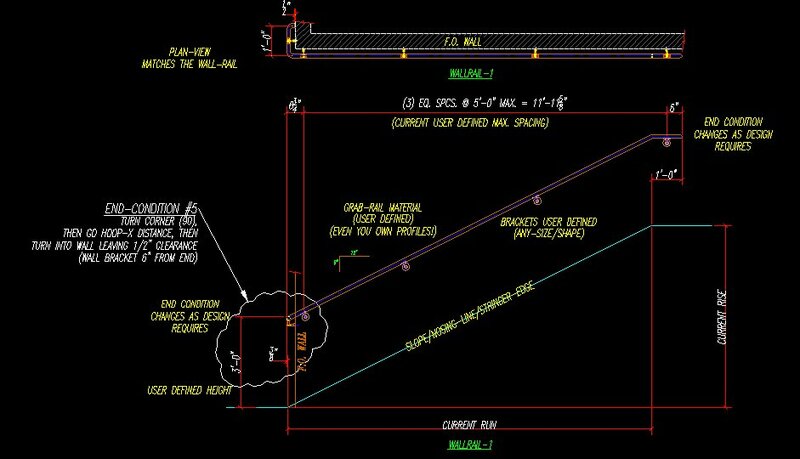 (12-12-12) Railings drawn in different directions at any angle required! (See video #2) Also explains ALL the capabilities of this program!!! (12-11-12) Sloped Arc'd railings added! Here's a Sneak-Peek video of the NEW Millennium-Railings drawing a combination of Flat, Sloped, Stair and Arc'd railings together. Another Sneak-Peek video of the NEW Millennium-Railings #2 drawing a combination of Flat, Sloped, Stair and Arc'd railings together in different directions. Based on DMSS's Custom-Railing-Designr and Sloped-Railing-Designr, this program does it ALL and MORE! Draws any combination of Flat, Sloped, Stair and Arc'd railings together or separately. Draw Flat/Sloped/Stair/Arc'd railings left, right, upwards or downwards (using any combination). Continuous left or right, also away-from-you or toward-you at any angle you need! 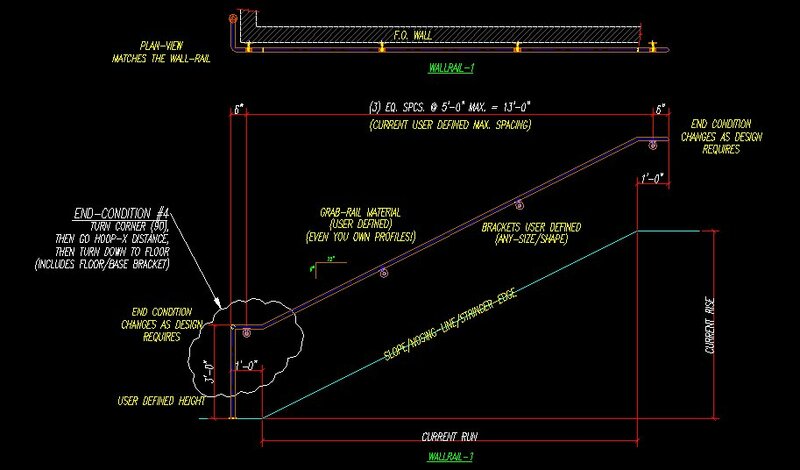 The erection elevation drawings will have "match-lines" for multiple page drawings (every time you turn a corner "match-lines" will show where the other railings are). Users can enter the length/rise/run/angle many different ways! 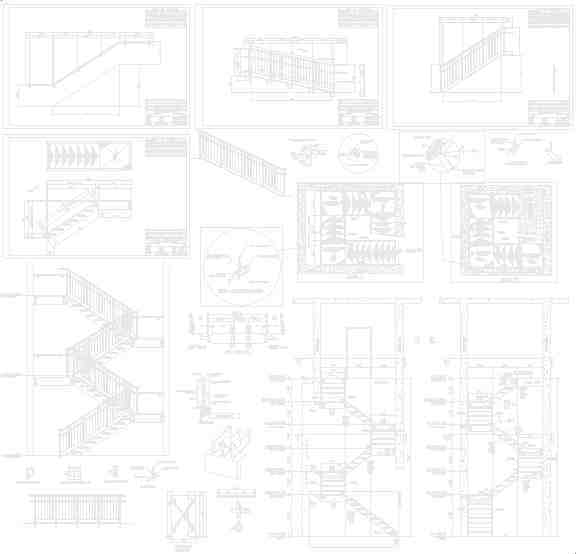 Draw the Plan-view first, then automatically draw the Erection & Shop drawings from them! 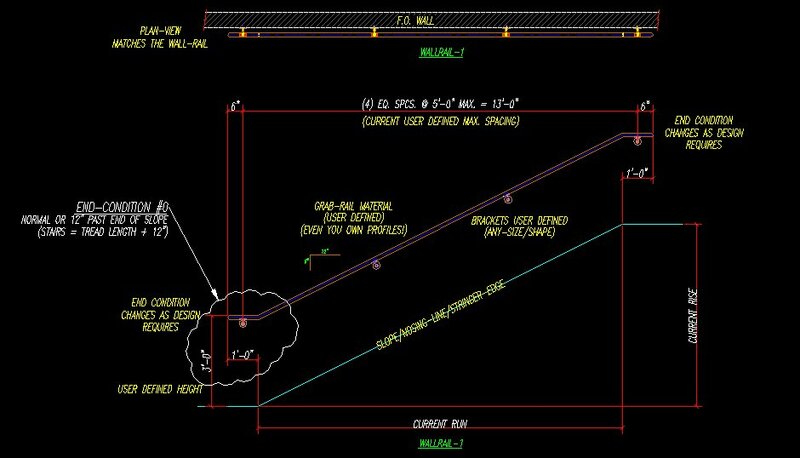 Draw the Erection/Elevation views first, then automatically draw the Plan-views & Shop drawings from them! Uses can draw just the Shop-drawings only too! 5) Section & Misc. views. Users can select from the "Standard" Section & Misc. drawings, AND/OR ADD THEIR OWN DRAWINGS TOO!!! 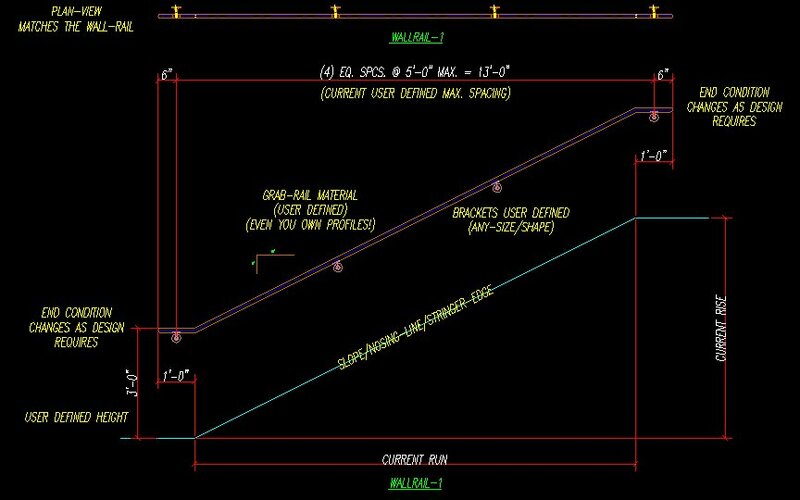 Also a Railing-Estimator will be added to this program! 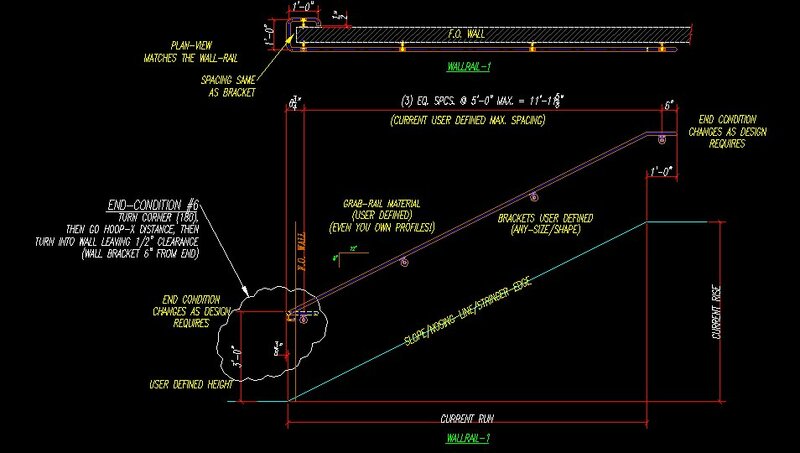 Enter the lengths needed (including rise/run/angle) and the Railing-Estimator will give a complete Bill-of-Materials for your projects! Users will have the option to include their unique Company part-numbers, lengths, sizes (and other misc. info.) to reduce the overall time to completion! 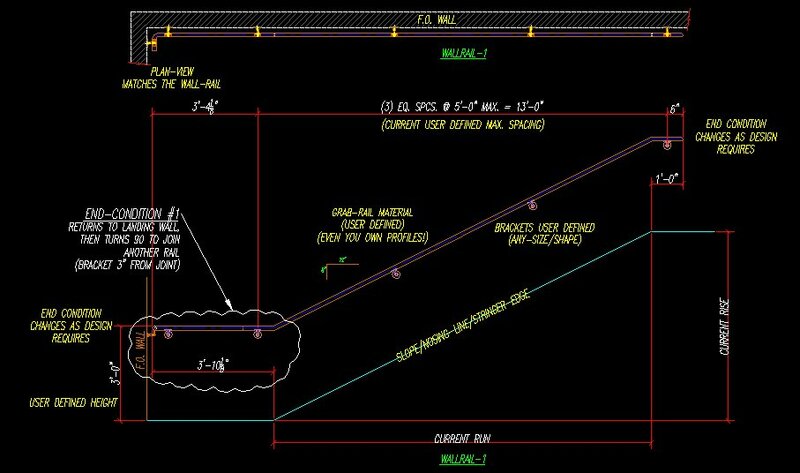 As a bonus... the Railing-Estimator's data can be used to automatically draw & detail the railing systems!!! Picket in 2-line, 3-line, 4-line stair & parapet. Glass in 2-line, 3-line, clipped and even structural. Custom in panel, basket (bellied), cable, mesh or multi-lateral. Use your own top-rail-profiles too! Post-base connections include welded, core-drilled, flat or face mounted base-plates! Start/End mounts will include wall-mounts or post-mounts for either side (also open for other options!). If you need the stair-posts mounted on the stair-treads, no problem! The program automatically places the post on the treads no further than the "maximum post offset" (user controlled too!). The user controls everything (with all the "designer" programs that are included too)! Note: The "designer" programs are free programs that help the user design specific parts to their own specifications (and most can be used as stand-alone programs too). Interior/Exterior boundaries include pickets, glass, cable, multi-horizontal and decorative. Users will be able to configure railing-sets and save them for future use! 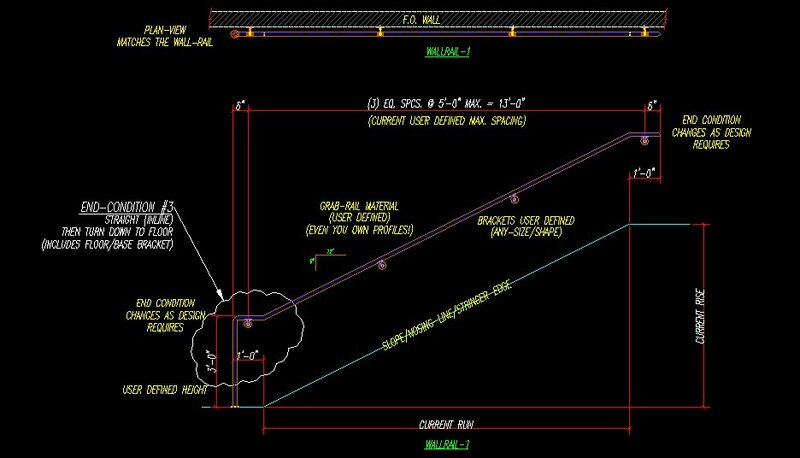 This means an unlimited amount of railing configurations can be accessed in seconds, reducing time to finished designs by 80+ %. Uses can expect all the erection-drawings, shop-drawings, section-drawings and submittal-drawings for really big jobs (50+ railings) in under 10 minutes! If you have suggestion you would like to see in the NEW program, send them to dan and @ and dansmark.com to be considered!